It's over 200 years since Hans Christian Andersen was putting pen to paper, so anyone doing a straightforward telling of his work today has their work cut out hooking in modern audiences. No such worries here, with Mike Kenny's clever and funny adaptation putting an entirely new framework around Andersen's tale and setting it in a children's home, where a bumper book of stories (including The Tin Soldier) comes out each night after the staff have gone to bed. A joint production by Birds of Paradise Theatre Company and the Festival Theatre, this show gets it right on so many levels. Live music is peppered throughout, played on the keyboard and beautifully sung by Lauren Gilmour, with Audrey Tait on her impressively large percussion kit. Robert Softley Gale as the central character of Jack is hilarious, with his modesty by-pass and sharp wit regularly hitting the spot. Completing the five-strong cast are Joseph Brown as Jack's likeable friend 'Kipper', who does a fine job involving the audience in a spot of 'hunt the rat', and the lovely Caroline Parker, who uses British Sign Language throughout to throw in her astute comments. 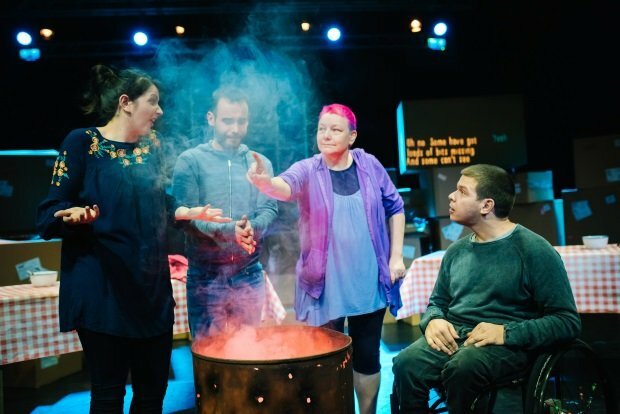 Together they all do two very important things: tell a good story well, and show audiences that there is no invisible line between disabled and non-disabled performers – they're all just performers. A message that in 2017 should be a given, but still relies on companies such as Birds of Paradise to convey, in a show where every word is said, signed and subtitled, because there's more than one way to tell a story. Edinburgh Festival Theatre Studio, until 23 Dec.
A clever and funny adaptation of the Hans Christian Andersen tale, now set in a children's home, by Birds of Paradise Theatre Company and the Festival Theatre.